U.S. stocks fell Wednesday amid mounting concerns about global economic growth and corporate earnings. 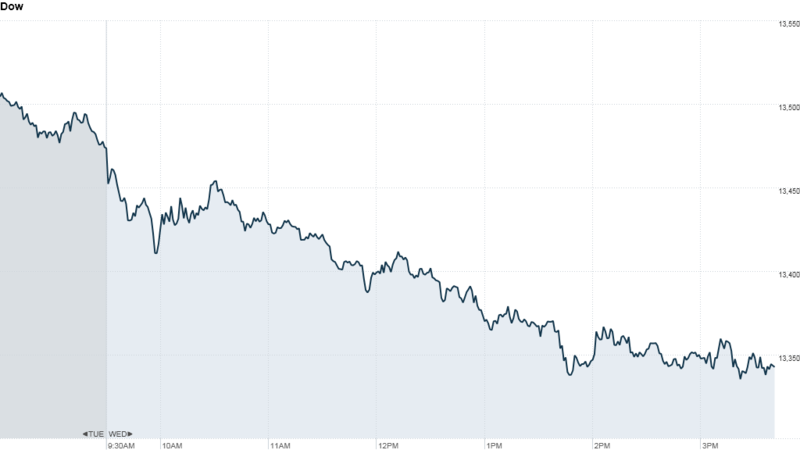 The Dow Jones industrial average slid 0.9%, while the S&P 500 lost 0.6%. The Nasdaq declined 0.4%. Alcoa (AA) sold off sharply and weighed on the Dow after the aluminum producer cut its forecast for Chinese demand late Tuesday. Shares of fellow Dow component Chevron (CVX) also sank after the oil company said its third-quarter earnings would be "substantially lower" than second quarter results. Consumer staples were among the best performers. Walmart (WMT) rose to a record high as the nation's largest retailer held its annual meeting. McDonald's (MCD) was also strong. In the banking sector, shares of JPMorgan (JPM) rose ahead of the bank's quarterly earnings report Friday. Alcoa's conservative outlook for China came one day after a report showed that Japanese car sales in China fell unexpectedly -- partly due to worsening relations between the two nations over a territorial dispute concerning a band of islands. However, the news out of China wasn't all bad. 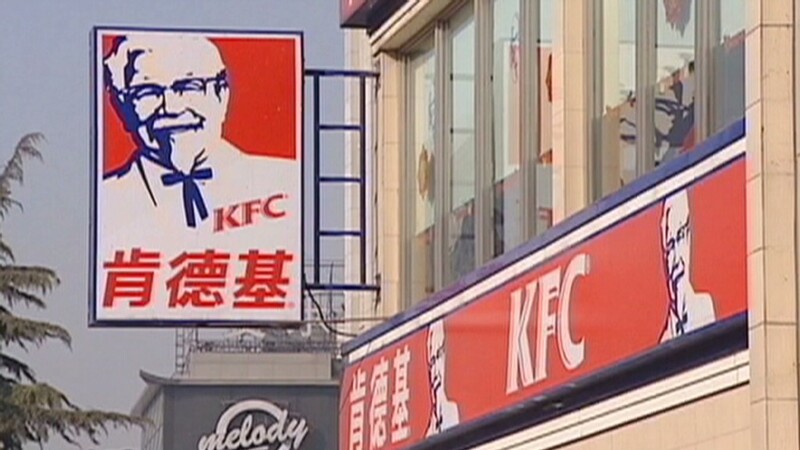 Shares of Yum Brands (YUM) rose 8% after it reported earnings Tuesday that beat expectations and reassured investors that sales at its China-based restaurants were still growing at a robust pace. In the United States, third-quarter earnings continued Wednesday morning with Costco (COST)reporting better-than-expected results. The market is in a "holding pattern" ahead of a slew of corporate reports due next week, said Art Hogan, managing director at Lazard Capital Markets. Analysts are expecting third-quarter earnings for the S&P 500 to decline 1.2%, according to S&P Capital IQ. That would be the worst since the third quarter of 2009. "It's a normal trading pattern ahead of some very important catalysts," said Hogan, pointing to the "fiscal cliff" debate in Congress and the presidential election in November. In addition to earnings, investors took in the latest edition of the Federal Reserve's latest snapshot of economic conditions across its 12 districts. The Beige Book showed economic activity overall continued to expand at a modest pace in late September and early October. Separately, the Mortgage Bankers Association reported mortgage applications fell 1.2% last week compared to the previous week. The Census Bureau said wholesale trade rose 2.1% in August versus the same month last year. Meanwhile, European stocks fell amid fears about the area's ongoing debt crisis. Britain's FTSE 100 ended 0.6% lower, the DAX in Germany fell 0.4%, while France's CAC 40 shed 0.5%. Companies: Shares of FedEx (FDX) rose after the shipping company announced "profit improvement" plans worth $1.7 billion over three years. FedEx also reaffirmed its earnings outlook for the second quarter and fiscal year 2013. Shares of gas engine manufacturer Cummins (CMI) fell on news that the company would fire 1,000 to 1,500 employees to deal with a weakening global economy. And in Europe, the expected EADS (EADSY) and BAE Systems (BAESF) merger is now on ice. The European defense companies dropped plans after failing to get enough political support for the $45 billion deal. Oil for November delivery fell $1.14 to settle at $91.25 a barrel. Gold futures for December delivery fell 10 cents to end at $1,765.10 an ounce. Bonds: The price on the benchmark 10-year U.S. Treasury rose, pushing the yield down to 1.69%.